The phospholipase A2 receptor (PLA2R) is the major target antigen in idiopathic membranous nephropathy. The technique for measuring antibodies against PLA2R and the relationship between antibody titer and clinical characteristics are not well established. Here, we measured anti-PLA2R (aPLA2R) antibody titer and subclass in a well defined cohort of 117 Caucasian patients with idiopathic membranous nephropathy and nephrotic-range proteinuria using both indirect immunofluorescence testing (IIFT) and ELISA. We assessed agreement between tests and correlated antibody titer with clinical baseline parameters and outcome. In this cohort, aPLA2R antibodies were positive in 74% and 72% of patients using IIFT and ELISA, respectively. Concordance between both tests was excellent (94% agreement, κ=0.85). Among 82 aPLA2R-positive patients, antibody titer significantly correlated with baseline proteinuria (P=0.02). Spontaneous remissions occurred significantly less frequently among patients with high antibody titers (38% versus 4% in the lowest and highest tertiles, respectively; P<0.01). IgG4 was the dominant subclass in the majority of patients. Titers of IgG4, but not IgG1 or IgG3, significantly correlated with the occurrence of spontaneous remission (P=0.03). In summary, these data show high agreement between IIFT and ELISA assessments of aPLA2R antibody titer and highlight the pathogenetic role of these antibodies, especially the IgG4 subclass, given the observed relationships between aPLA2R titer, baseline proteinuria, and outcome. Meanwhile, several studies have evaluated anti-PLA2R antibodies (aPLA2R) in patients with iMN. These studies have confirmed that aPLA2R antibodies are present in 60%–80% of patients with iMN. Some studies even reported an association between antibody titer and clinical characteristics, such as proteinuria,6 time to remission,7 and time between change in antibody titer and development of a remission and relapse.8,9 However, it is difficult to draw firm conclusions, because these studies were limited by small sample size and/or their cross-sectional nature. Moreover, some studies are not comparable because of the use of different techniques to detect the aPLA2R antibodies (Western blotting and indirect immunofluorescence staining [IIFT]). There is also debate on the role of antibody subclass. Although most studies agree that IgG4 is the predominant subclass, antibodies of the IgG1 and IgG3 subclasses are often found. The purpose of the current study was to evaluate aPLA2R in a well defined and phenotyped cohort of iMN patients. To this end, members of our consortium have validated a commercially available IIFT test for the detection of aPLA2R10 and developed an ELISA assay, which allows rapid and simple quantification of aPLA2R levels.11 Specifically, we examined concordance between the IIFT and ELISA tests in detecting aPLA2R and assessed the different IgG antibody subclasses. We also studied correlations between presence of aPLA2R, antibody titers, and subclass on the one hand and clinical parameters, such as baseline proteinuria and long-term outcome, on the other hand. Our cohort (combined Dutch, French, and Manchester) included 117 patients with iMN (91 male and 26 female). Baseline characteristics are presented in Table 1. Typically, the majority of patients was male and middle-aged at time of diagnosis. Median serum creatinine was 95 µmol/L (range=51–320 µmol/L), and median proteinuria was 10.2 g/d (range=3.6–37.9 g/d). With the IIFT test, aPLA2R antibodies were positive in 74% of patients compared with 72% of patients with the ELISA text. In seven (6%) patients, there was a discrepancy between both tests; two patients with negative staining in IIFT had positive ELISA titers, whereas five patients with positive IIFT staining were negative according to the ELISA. Thus, overall agreement between both tests was 94%, with a κ measure of agreement of 0.85. In the cohort of 117 patients, aPLA2R titers assessed by IIFT (dilutions of 1/10–1/3200) and ELISA (units per milliliter) were compared. Although there was a good correlation between titers of IIFT and ELISA (r=0.868, P<0.01), there was a large overlap between IIFT and ELISA titers (Figure 1). 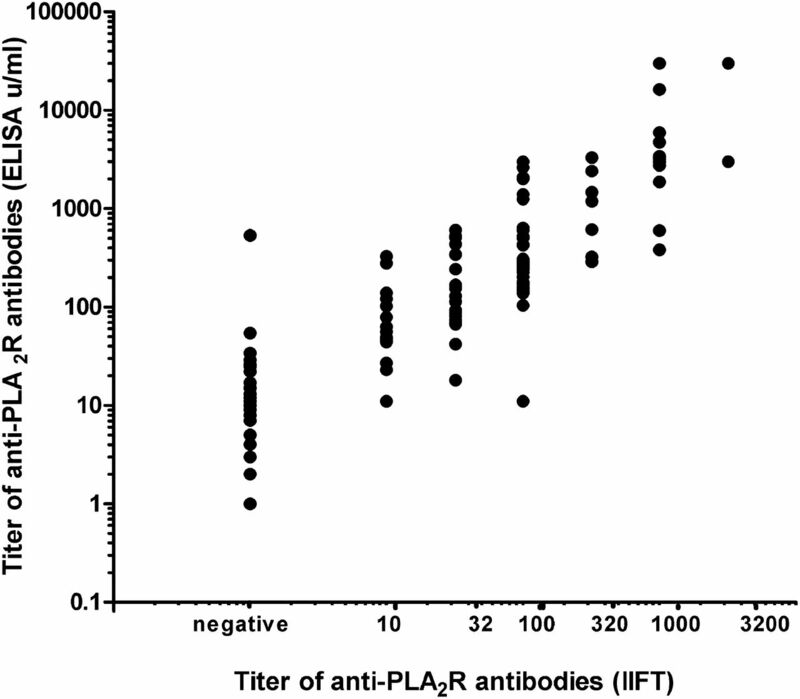 Correlation between anti-PLA2R antibody levels measured with IIFT (titers: 1/10 to 1/3200) and ELISA (units per milliliter) techniques. There is a significant correlation (r=0.868, P<0.01), but large overlap. We first assessed differences between aPLA2R-positive and -negative patients. For this analysis, we only included the patients with concordant results in both IIFT and ELISA tests. Baseline characteristics did not significantly differ between aPLA2R-positive and -negative patients (Table 2). For comparison, characteristics of the discordant patients are provided in Table 2. In a sensitivity analysis, when adding the discordant patients to either the positive or negative cohorts, no differences between aPLA2R-positive and -negative patients were observed. We next assessed if antibody titers correlated with baseline characteristics. In aPLA2R-positive patients, antibody titer measured by ELISA weakly correlated with baseline proteinuria (n=82; r=0.259, P=0.02). Using the IIFT assay, the correlation was not significant (n=82; r=0.158, P=0.16). Antibody titer may not reflect antibody production, because IgG will be lost in the urine. Therefore, we reanalyzed the data and adjusted the titers for fractional IgG excretion (as representative of urinary loss of antibodies) using the Dutch cohort (Concise Methods). In this cohort, absolute ELISA aPLA2R titers correlated with baseline proteinuria, and the strength of correlation substantially increased after adjustment (n=52; r=0.347, P=0.01 without adjustment; r=0.679, P<0.01 after adjustment) (Figure 2). In the Dutch cohort, conclusions were similar when using IIFT titer (n=52; r=0.297, P=0.03 without adjustment; r=0.680, P<0.01 with adjustment) (Supplemental Figure 1) Of note, the adjusted titers also correlated with baseline serum creatinine concentration (ELISA, r=0.479 with P<0.01; IIFT, r=0.487 with P<0.01) and baseline eGFR (ELISA, r=−0.482 with P<0.01; IIFT, r=−0.455 with P<0.01). 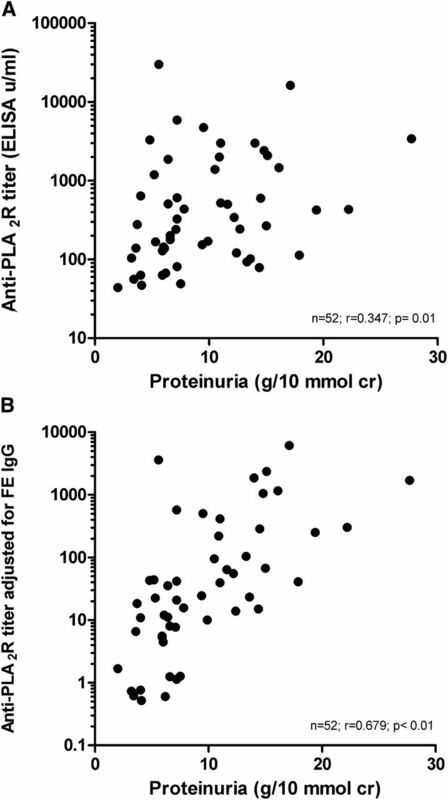 Correlation between anti-PLA2R levels measured with an ELISA technique and proteinuria in patients of the Dutch cohort. (A) Unadjusted analysis. (B) Anti-PLA2R levels adjusted for fractional excretion of IgG. IgG subclasses were measured qualitatively by IIFT. The subclasses were present in 56% (IgG1), 4% (IgG2), 53% (IgG3), and 69% (IgG4) of all iMN patients. The presence of IgG4 correlated best with antibody positivity as established with the standard IIFT (r=0.880, P<0.01). In 11 of 87 (13%) aPLA2R-positive patients, only IgG4 subclass antibodies were present. However, in 6 of 87 (7%) patients with a positive overall IIFT test, the subclass IgG4 test was negative. In all these patients, both IgG1 and IG3 staining were positive. We also quantitatively measured IgG subclasses with subtype-specific ELISA tests. The different subclasses were detectable above the normal threshold in 54%, 34%, 67%, and 74% of all patients for IgG1, IgG2, IgG3, and IgG4, respectively. Again, the presence of IgG4 correlated best with antibody positivity as defined by the total IgG ELISA (r=0.761, P<0.01). In addition, in aPLA2R-positive patients, the level of aPLA2R–IgG4 (in nanograms per milliliter) correlated very well with the titer of total IgG ELISA (in units per milliliter) (Figure 3). Ig4 was the sole antibody subclass present in 3 of 84 (4%) aPLA2R-positive patients. In 4 of 84 (5%) patients with positive overall ELISA, IgG4 subclass was negative. IgG1 was present in two patients, one time combined with IgG3 and one time combined with IgG2. In one patient, only IgG2 was positive, and in the last patient, IgG2 was present below the normal threshold. Agreement of IgG subclass testing between IIFT and ELISA techniques was only moderate for IgG1, IgG2, and IgG3 (74%, 63%, and 71% overall agreement, respectively). In contrast, overall agreement for IgG4 positivity was fair with 89% concordance. 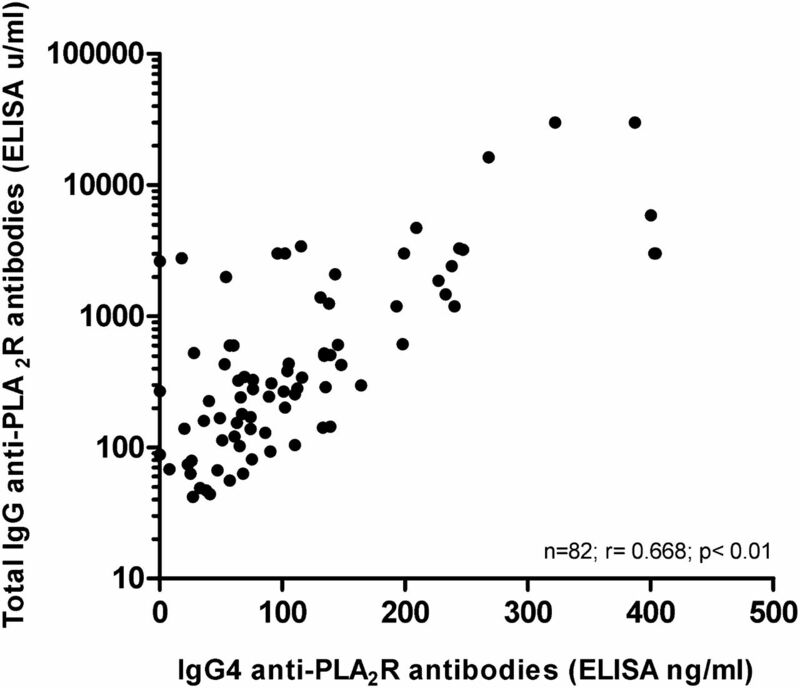 Correlation between IgG4 anti-PLA2R antibody levels and total IgG anti-PLA2R (ELISA technique). IgG4 antibodies and total IgG antibodies were quantitated (see Concise Methods). There is a significant correlation (r=0.668, P<0.01). Remarkably, in aPLA2R-positive patients, the level of aPLA2R IgG4, when adjusted for fractional IgG excretion, also correlated well with baseline proteinuria (n=52; r=0.768, P<0.01). Outcome data were available for 93% of patients (n=109) after a median follow-up of 54 months (range=2–277 months). During follow-up, 41 (38%) patients had been treated with supportive therapy only, whereas 68 (62%) patients had received immunosuppressive therapy (various agents were used, such as cyclophosphamide, mycophenolate mofetil, rituximab, and adrenocorticotrophic hormone); 14 (13%) patients progressed to renal failure, whereas remission of proteinuria occurred in 77 (71%) patients some time during follow-up (38% of patients had partial remission, and 33% of patients had complete remission). Of these remissions, 49 (64%) remissions developed after immunosuppressive treatment, and 28 (36%) remissions were considered spontaneous remissions. Time to remission was significantly shorter in patients treated with immunosuppressive drugs (median=13 months [range=5–276 months] versus median=31 months [range=7–181 months], P<0.01) in patients with spontaneous remissions. Comparing aPLA2R-positive versus -negative patients, there was no difference between the percentages of patients that were treated with immunosuppressive drugs (63% versus 67%). Although remissions tended to occur slightly more often in the aPLA2R-negative patients (83% versus 68%) and were more often spontaneous (33% versus 24% in aPLA2R-positive patients), the differences were not statistically significant. Median time to remission did not differ between aPLA2R-positive and -negative patients, and this conclusion also held when analysis was limited to patients treated with immunosuppressive agents. Next, we analyzed the aPLA2R-positive patients for evidence that the level of antibodies was correlated with outcome. Patients were divided in tertiles based on the ELISA titer. Renal failure tended to occur less frequently in patients in the lowest tertile of antibody titer. More importantly, there was a significant difference in the rate of spontaneous remissions, because only one spontaneous remission occurred in the patients with aPLA2R titers in the highest tertile (P<0.01) (Table 3). Using IIFT, a lower incidence of spontaneous remissions in the category of patients with the highest aPLA2R titer was also observed (P=0.03) (Table 4). Outcome was related to IgG subclass and titer. Specifically, when analyzing the data according tertiles of IgG4 antibody titer, spontaneous remissions were less likely to occur in patients with the highest titer of IgG4 antibodies (Supplemental Table 1A). Analysis of data according IgG3 or IgG1 subclass did not reveal significant differences (Supplemental Table 1, B and C). We separately analyzed treatment response in relation to anti-PLA2R titer in patients who were treated with immunosuppressive agents. Patients in the highest tertile of antibody titer more often needed immunosuppressive therapy (88% versus 54% and 48% of patients in the middle and lowest tertiles, respectively). Moreover, antibody levels predicted the response to immunosuppressive therapy defined as time from start therapy to remission, which was a median of 5 months (range=3–7 months) in the lowest tertile, 7 months (range=5–32 months) in the middle tertile, and 10 months (range=6–219 months) in the highest tertile (P<0.01). We detected antibodies against PLA2R in 74% of patients with iMN using either IIFT or ELISA. Our data underline the pathogenetic role of these antibodies, especially of the IgG4 subclass, given the relationship of antibody titer with baseline proteinuria and outcome. In seven patients with discrepant results in IIFT and ELISA, a third assay was performed, namely the Western blot (WB) assay (Supplemental Methods). The assay was performed under nonreducing conditions at a serum dilution of 1:10. In summary, four of five patients with positive IIFT staining and negative ELISA titers showed antibody positivity in the Western blot. One of two patients with negative IIFT staining and positive ELISA titer was also negative in WB, and the other patient was clearly positive (Supplemental Figure 2). In conclusion, results with WB were mostly, but not always, in line with the results of IIFT. We included 117 patients with iMN of recent onset and nephrotic range proteinuria. In our cohort, the largest studied thus far, 74% (IIFT) and 72% (ELISA) were positive for aPLA2R. In the literature, the reported prevalence of aPLA2R antibodies in patients with iMN varies between 52% in a German study and 82% in a Chinese cohort.7,9 These differences may be explained by differences in ethnicity, technique of the assay, clinical characteristics of the included patients, or nature of the study.12 The low prevalence rate of 52% was found in a cross-sectional study that used the IIFT test.9 The work by Hoxha et al.9 included patients with active as well as inactive disease, and in 48% of patients, no data on proteinuria were available.9 When limiting the analysis to patients with proteinuria>3.5 g/d, which likely reflects active disease, the percentage of patients with anti-PLA2R antibodies was 66%. The work by Qin et al.7 suggested that a more sensitive analysis may reveal an even higher prevalence. In their standard WB assay, 82% of patients were aPLA2R-positive.7 However, when using less diluted patient serum and a higher concentration of detecting antibody, a low titer of anti-PLA2R antibody was detectable in 10 of 11 apparently negative patients.7 The specificity of these findings was high, because low titers were not found in 20 healthy controls.7 In contrast, we have used a very sensitive ELISA technique, which detects a signal representing low antibody titers in normal controls. Therefore, it seems most unlikely that we have missed aPLA2R-positive patients. Altogether, our data indicate that 70%–75% of recently presenting Caucasian patients with nephrotic syndrome and iMN have detectable aPLA2R. We tested the clinical relevance of the antibodies by evaluating the correlation of antibody titers with proteinuria and outcome. We observed a weak but significant correlation between baseline proteinuria and aPLA2R titers measured by ELISA, although significance was lost when using the data obtained with the IIFT assay. Additional analysis of our data provided strong additional support for the clinical relevance of the antibody levels. First, when limiting the analysis to the patients of the Dutch cohort, a significant correlation between aPLA2R titer and proteinuria was noted both with ELISA and IIFT. In the Dutch cohort, data on proteinuria are less variable; these patients collected two sequential 24-hour urine samples, and mean values were used for the analysis. Moreover, in the Dutch patients, we also collected exactly timed urine samples under standardized conditions (patients resting quietly) and quantitated protein excretion. There was a significant correlation between aPLA2R titer and protein excretion (ELISA, r=0.374, P<0.01). Second, in patients with a nephrotic syndrome, significant quantities of Igs are lost in the urine. Therefore, serum levels do not necessarily reflect antibody production and exposure of the podocyte to IgG. Indeed, if we corrected serum aPLA2R levels for urinary losses, all correlations became stronger. We admit that these adjustments, although plausible, only provide circumstantial evidence. Because proteinuria is factored in both the x and y variables, stronger correlations can be expected. Of note, when adjusting serum aPLA2R titer for serum IgG concentration, similar significant correlations were noted (data not shown). The clinical relevance of aPLA2R titers is also supported by our observation that aPLA2R titers were related to outcome. Specifically, spontaneous remissions were very rarely seen in patients with highest aPLA2R levels. This latter observation suggests that the level of antibody titer is correlated with severity of disease. We cannot exclude that the patients with low titers of anti-PLA2R may be on the downward slope of their immunologic disease course and thus, are more likely to develop a spontaneous remission. However, we consider this possibility unlikely, because all serum samples were collected shortly after the initial diagnostic biopsy (median=2 months, maximum=6 months). Moreover, time to remission was relatively long (median=31 months) in patients who developed a spontaneous remission. Few studies have addressed the clinical relevance of aPLA2R antibody levels. In another collaborative study, we reported 14 aPLA2R-positive patients with iMN and a nephrotic syndrome studied at baseline, at remission, and during relapse.6 In these patients, aPLA2R antibodies were detected by a WB technique. There was a striking correlation between aPLA2R titer and proteinuria when using both baseline data and all data. There was an association between aPLA2R and clinical course, because antibodies disappeared in all but one patient during remission and reappeared in all evaluated patients during relapse. A similar association was reported in the work by Beck et al.8 that evaluated the time course of anti-PLA2R in relation to proteinuria and outcome in patients with iMN treated with rituximab. Equally, in this study, the decrease of anti-PLA2R titer preceded the decrease of proteinuria and predicted outcome. The work by Kanigicherla et al.11 measured anti-PLA2R by ELISA. In their cross-sectional analysis, antibody positivity was related to disease activity, and in the patients with active disease, the titer of PLA2R predicted outcome. An association between the titer of anti-PLA2R and outcome was also suggested in the work by Qin et al.7 In patients with a low titer, the time to remission was considerably shorter (6.6 versus 14.5 months), and the likelihood of remission was higher (50% versus 30% at 12 months).7 Overall, these data show that the course of aPLA2R in patients with iMN parallels the clinical course. Moreover, the levels of aPLA2R correlate with proteinuria and outcome. This finding adds to the hypothesis that aPLA2R antibodies, indeed, may be of pathogenetical and clinical relevance, although other antibody specificities might be associated. We also evaluated the subclass of the aPLA2R. Our data confirmed that IgG4 is the dominant subclass in most patients. However, levels of IgG4 aPLA2R correlated with proteinuria only in an adjusted analysis. This finding may be explained by the fact that IgG4 is a negatively charged protein, and glomerular permselectivity changes preferentially, affecting the filtration of negatively charged proteins. Indeed, the ratio of the clearance of IgG and IgG4 decreased in patients with minimal change disease, compatible with increased filtration of IgG4.17 Still, we cannot exclude that these adjustments may cause an artificial correlation. We did, however, find a significant correlation between IgG4, but not IgG1 and IgG3, titers and the occurrence of spontaneous remissions. Most patients have IgG4 combined with other subclasses, 5%–10% of positive patients have only IgG4, and another 5%–10% of positive patients have no IgG4 at all. However, the fact that IgG4 is prevailing and that there is a correlation with proteinuria argues for a pathogenic role of IgG4. It has been suggested that IgG4, although not binding complement, may activate complement by binding mannose binding lectin. In conclusion, in a large, well phenotyped cohort of patients with iMN, aPLA2R antibodies were measured with IIFT and ELISA, with excellent agreement between both assays. Prevalence of aPLA2R antibodies was 72%–74%. Antibody titers correlated with baseline proteinuria. The suggestion that the level of antibodies reflects severity of disease was supported by the observation that spontaneous remissions occurred significantly less frequently during follow-up in patients with high antibody titers. IgG4 was the dominant subclass in the majority of patients and correlated with the occurrence of spontaneous remissions as well. However, IgG4 antibodies are combined with other aPLA2R Ig subclasses in most patients. Specifically, all Dutch patients were studied under standardized conditions, with collection of two 24-hour urine samples for measurement of total proteinuria and timed urine samples for measurement of urine low and high molecular proteins. All patients were prospectively followed, and clinical outcome data were available for most patients. Available sera were exchanged and shipped for measurement of aPLA2R by IIFT (by H.D.) and ELISA (by P.E.B.) within our groups. Anti-PLA2R–specific autoantibody titers were measured using IIFT (IIFT Mosaic; EUROIMMUN AG, Lübeck, Germany). The details of this technique, which uses transfected HEK 293 cells that express PLA2R and nontransfected cells as controls, have been described previously.9,10 Negativity of aPLA2R was defined as absence of detectable antibodies at serum dilution of 1/10. Antibody positivity was defined as positive staining at serum dilutions of 1/10 or higher. In aPLA2R-positive patients, quantitative measurements were performed using different serum dilutions (1/10, 1/100, and 1/1000). A strong staining at a dilution of 1/1000 was defined as 1/3200. In addition, subtype specificity of the antibodies was assessed in aPLA2R-positive patients by qualitative IIFT. To this end, after incubation with serum, slides were incubated with monoclonal antihuman subclass-specific IgG antibodies commercially provided by Margaret Goodall, University of Birmingham and revealed by Alexa-coupled anti-mouse secondary antibody (Molecular Probes). Again, positivity for an IgG subclass was defined as positive staining at serum dilution of 1/10. The full-length protein sequence (180 kD) was used to coat ELISA plates at 0.125 µg/ml in sodium bicarbonate buffer (pH 9.6) for 18 hours. The PLA2R protein construct was the full extracellular sequence (amino acids 21–1397; containing N-terminal cysteine-rich domain, Fibronectin Type II domain, and C-type lectin domain 1–8) devoid of the transmembrane domain (amino acids 1398–1418) and cytoplasmic domain (amino acids 1419–1463). Plates were blocked for 1 hour with SuperBlock (Thermosystems) and kept at 4°C until use (within 3 days). Patient serum diluted 1:100 in superblock containing 0.1% Tween 20 was added in duplicate 100-μl aliquots to the ELISA plate, which also contained a standard dilution series of standard-2 (STD2) and quality control 1 (QC1) in duplicate wells (a between-plate quality control sample). After 2 hours incubation at room temperature on a plate shaker, the plates were washed thoroughly (eight times) with PBS plus 0.1% Tween 20. Anti-human IgG–horseradish peroxidase conjugate (HRP; Jackson Laboratories) diluted 1:25,000 in Superblock was added (100 μl per well) and incubated for 2 hours as before. After washing as before, enzyme substrate tetramethylbenzidine (Sigma) was added and developed for 10 minutes, and the reaction was stopped with 0.5 M H2SO4. The plates were read at 450 nm, standard curves were plotted using Softmax software, and values were assigned to samples. Samples that were off scale were diluted 1:1000 to 1:10,000 and reanalyzed. Standard STD2 was allocated a value of 99,000 U/ml and was a pool of high-titer samples (n=10) that had been microfuged and filtered through 0.22-µm membrane, aliquoted, and stored at −80°C. For each ELISA plate, a dilution series covering the range from 3000 to 12.3 U/ml was applied to the plate. Seventy-three serum samples from healthy individuals (mean age=41±10 years) were used to define the normal range. Using mean + 3 SD of the normal range, we report a threshold above 40 U/ml as positive. The assay was monitored for between-batch variation by incorporating an aliquot of the QC sample in duplicate on each plate. The QC sample was a pool of iMN sera (n=10) with borderline positivity (53 U/ml) that had been processed and stored in the same manner as STD2. Results from 22 different plate batches show a coefficient of variation of 17.8%. Samples applied to the same plate report less than 8% variation. The assay for IgG subclass aPLA2Rab was similar to the assay described above, and each sample (dilution of 1:100) was applied to a set of four plates. The standard curve for each set of plates used myeloma IgG1, IgG2, IgG3, or IgG4 (the binding site) coated in the standard wells covering the range of 250–8 ng/ml. Anti-IgG–HRP was substituted in the second incubation with sheep anti-IgG subclass (G1, G2, G3, or G4) HRP conjugate (the binding site) at dilutions of 1:16,000, 1:8000, 1:32,000, and 1:16,000, respectively, in each of the four plates. The plates were developed and read as in the total aPLA2R assay. A standard curve for the subclass concentration was plotted on each plate, and test sample concentrations were calculated from the curve and expressed as nanograms per milliliter aPLA2R. Subclass aPLA2R levels were also measured in healthy controls (n=33), providing the normal values for the assays. Positivity for IgG subclass was defined as a value more than mean + 3 SD (>8.6 ng/ml for IgG1, >36.5 ng/ml for IgG2, >2.3 ng/ml for IgG3, and >4.9 ng/ml for IgG4). We assessed the concordance between the IIFT and ELISA tests for detecting aPLA2R. IIFT testing was performed in Paris, France (laboratory of H.D. and P.R. ), and ELISA testing in the same samples was performed in Manchester, United Kingdom (laboratory of P.E.B.). Both laboratories were not aware of the other’s test results. Results were combined with clinical data and analyzed in Nijmegen, The Netherlands (by J.M.H. and J.F.W.). In absence of a reference standard, agreement between both tests is reported as overall percentage of agreement and Cohen’s κ value of agreement. In additional analyses, where we compared aPLA2R-positive with -negative patients, only those patients with results of the two tests concordant were considered positive. Baseline clinical data were available for all three cohorts. Proteinuria data were reported as grams per day in British patients and gram per 10 mmol creatinine in French patients. For Dutch patients, both 24-hour collections and protein/creatinine ratios were available. To be able to perform analyses for the total cohort of patients, proteinuria per 10 mmol creatinine in the French cohort was re-expressed as grams per day by multiplying with a factor of 1.15 in men and 1.00 in women (based on observed mean daily urinary creatinine excretion).18 Estimated GFR (eGFR) at baseline was estimated by applying the Modification of Diet in Renal Disease 4 (MDRD4) formula. Correlations between aPLA2R titers (measured by both IIFT and ELISA) and clinical parameters were assessed. Because antibody titer itself could be influenced by the magnitude of proteinuria (by subsequent loss of antibodies in the urine), we repeated these analyses for titers adjusted for fractional IgG excretion (titer multiplied by fractional IgG excretion; data were available in Dutch cohort only). Outcome data were available in most patients. Partial remission was defined as proteinuria<3.5 g/d with a decrease of proteinuria>50% from baseline and stable renal function. Remission was considered complete when protein excretion was <0.2 g/d with stable renal function. Furthermore, remissions were classified as spontaneous if occurring without the use of immunosuppressive agents any time during follow-up. Renal failure was defined as a sustained increase of serum creatinine>50% from baseline. For descriptive statistics, data are presented as mean (±SD) or median (range) when appropriate. The correlation between several parameters (nonparametric distributions) was analyzed by Spearman’s rank coefficient of correlation; t, Mann–Whitney U, and Kruskall–Wallis tests were used for comparison between groups. Cumulative probabilities of an event (e.g., remission or renal failure) were estimated according to Kaplan and Meier tests. Generalized Wilcoxon (Breslow) tests were used to compare the interval for the appearance of these events (e.g., time to remission). All statistics were performed using PASW (SPSS) software, version 18.0.2 (IBM, Armonk, NY). Differences were considered significant with P value<0.05. For the Dutch cohort, we acknowledge the physicians, research nurses, and patients who contributed to the studies from the following hospitals: Jeroen Bosch Hospital, ‘s-Hertogenbosch, Canisius Wilhelmina Hospital, Nijmegen, Maxima Medical Center, Veldhoven, Laurentius Hospital, Roermond, Hospital Gelderse Vallei, Ede, Hospital Rijnstate, Arnhem, Franciscus Hospital, Roosendaal, St. Elisabeth Hospital, Tilburg, Gelre Hospitals, Apeldoorn, Slingeland Hospital Doetinchem, Hospital Bernhoven, Veghel, Catharina Hospital, Eindhoven, and Amphia Hospital, Breda. For the French cohort, we acknowledge Ms. Karine Dahan for patients’ care. We acknowledge the physicians, research nurses, and patients who contributed. We thank the UK DNA Banking Network archive (funded by the Medical Research Council and Kidney Research UK at the Centre for Integrated Genomic Medical Research, University of Manchester) for iMN sample management. J.M.H. and J.F.W. are supported by Dutch Kidney Foundation Grants NSN OW8 and KJPB 11.021. H.D. is the recipient of a Contrat d’Interface from Assistance Publique-Hôpitaux de Paris. H.D. and P.R. are supported by an Agences de la Biomédicine Grant, Agence Nationale pour la Recherche Grant ANR-07-Physio-016-01, Coordination Theme 1 (Health) of the European Community’s 7th Framework Program Grant HEALTH-F2-2007-201590, and a Fondation pour la Recherche Médicale Grant. C.D.S. and P.E.B. acknowledge support from the Manchester Biomedical Research Centre, Manchester Academic Health Science Centre, and Kidneys for Life Charity (505256). J.M.H., H.D., P.E.B., and J.F.W. contributed equally to this work. This article contains supplemental material online at http://jasn.asnjournals.org/lookup/suppl/doi:10.1681/ASN.2012030242/-/DCSupplemental.